Commercially available conventional amphotericin B for IV infusion must be reconstituted and diluted prior to administration. The drug must not be prepared with any diluents other than those specified below, and strict aseptic technique must be observed. Conventional amphotericin B should be reconstituted to a concentration of 5 mg/mL by adding 10 mL of sterile water for injection without bacteriostatic agent to a vial labeled as containing 50 mg of drug. The sterile water diluent should be rapidly added to the vial using a sterile syringe and a 20-gauge needle; the vial should be immediately shaken until the colloidal dispersion is clear. For IV infusion, the colloidal dispersion is further diluted, usually to a concentration of 0.1 mg/mL, with 500 mL of 5% dextrose injection (the dextrose injection must have a pH exceeding 4.2). Although the pH of commercially available 5% dextrose injection usually exceeds 4.2, the pH of each container of 5% dextrose injection should be determined and, if the pH is low, it may be adjusted with a sterile buffer solution in accordance with the instructions provided by the manufacturer of conventional amphotericin B. Reconstituted conventional amphotericin B or dilutions of the drug must not be used if precipitation or foreign matter is evident. An inline membrane filter may be used during administration of conventional amphotericin B; however, the mean pore diameter of the filter should not be less than 1 µm to ensure passage of the amphotericin B colloidal dispersion. IV infusions of conventional amphotericin B containing a drug concentration of 0.1 mg/mL or less should be used promptly after preparation. IV infusions of conventional amphotericin B are given slowly over a period of approximately 2-6 hours, depending on the dose being administered. Although IV infusions of conventional amphotericin B have been well tolerated in some patients when given over 1-2 hours, the manufacturer and many clinicians state that rapid IV infusions of conventional amphotericin B should be avoided since potentially serious adverse effects (e.g., hypotension, hypokalemia, arrhythmias, shock) may occur. Lyophilized amphotericin B cholesteryl sulfate complex (Amphotec®) should be reconstituted by adding 10 or 20 mL of sterile water for injection to vials labeled as containing 50 or 100 mg, respectively, of amphotericin B to provide a colloidal dispersion containing 5 mg/mL. The sterile water diluent should be rapidly added to the vial using a sterile syringe and a 20-gauge needle; the vial should be gently shaken by hand until all solids have dissolved. The reconstituted colloidal dispersion must be further diluted in 5% dextrose injection to provide a final concentration of approximately 0.6 mg/mL (range: 0.16-0.83 mg/mL). The lyophilized powder should not be reconstituted with solutions containing sodium chloride or dextrose, and the reconstituted drug shouldnot be admixed with other drugs or any solution containing sodium chloride or electrolytes. Amphotericin B cholesteryl sulfate complex should not be filtered prior to administration and should not be administered using an inline filter. The drug should be administered using a separate infusion line; if an existing IV line is used, it should be flushed with 5% dextrose injection before amphotericin B cholesteryl sulfate complex is infused. IV infusions of amphotericin B cholesteryl sulfate complex should be administered at a rate of 1 mg/kg per hour. Each time a new course of amphotericin B cholesteryl sulfate complex is administered, it may be advisable to administer a small test dose of the drug immediately prior to the first dose (e.g., 10 mL of a solution containing 1.6-8.3 mg given over 15-30 minutes) and observe the patient over the next 30 minutes. If the drug is well tolerated, the infusion time may be shortened to a minimum of 2 hours; however, the infusion time may need to be lengthened in patients who experience acute reactions or cannot tolerate the infusion volume. Prior to IV infusion, amphotericin B lipid complex injectable suspension concentrate (Abelcet®) must be diluted in 5% dextrose injection to a concentration of 1 mg/mL; a concentration of 2 mg/mL may be appropriate for pediatric patients and patients with cardiovascular disease. Solutions containing sodium chloride or bacteriostatic agents should not be used to dilute amphotericin B lipid complex, and the drug should not be mixed with other drugs or with electrolytes. To prepare IV infusions of amphotericin B lipid complex, vials labeled as containing 5 mg/mL should be shaken gently until there is no evidence of yellow sediment on the bottom of the vial. The appropriate dose should be withdrawn from the required number of vials into one or more sterile 20-mL syringes using an 18-gauge needle. The needle should be removed from the filled syringe and replaced with the 5-µm filter needle provided by the manufacturer; each filter needle may be used to filter the contents of up to 4 vials of the drug. The filter needle should then be inserted into an IV container of 5% dextrose injection and the contents of the syringe injected into the container. Amphotericin B lipid complex diluted in 5% dextrose injection should not be used if there is any evidence of foreign matter in the solution. The drug should be administered using a separate infusion line; if an existing IV line is used, it should be flushed with 5% dextrose injection before amphotericin B lipid complex is infused. An inline membrane filter should not be used during administration of amphotericin B lipid complex. Amphotericin B lipid complex injectable suspension concentrate must be diluted prior to IV infusion. IV infusions of diluted amphotericin B lipid complex should be infused at a rate of 2.5 mg/kg per hour. Prior to initiation of the infusion, the IV container of diluted drug should be shaken until the contents are thoroughly mixed; the infusion container should then be shaken every 2 hours if the infusion time exceeds 2 hours. Amphotericin B liposomal (AmBisome®) must be reconstituted by adding 12 mL of sterile water for injection to a vial labeled as containing 50 mg of amphotericin B to provide a solution containing 4 mg/mL. Other diluents (e.g., diluents containing sodium chloride or a bacteriostatic agent) should not be used to reconstitute amphotericin B liposomal, and reconstituted solutions should not be admixed with other drugs. The appropriate amount of reconstituted amphotericin B liposomal should be withdrawn into a sterile syringe. The 5-µm sterile, disposable filter provided by the manufacturer should then be attached to the syringe and the syringe contents injected through the filter into the appropriate volume of 5% dextrose injection to provide a final concentration of 1-2 mg/mL. Lower concentrations (0.2-0.5 mg/mL) may be appropriate for infants and small children.mphotericin B liposomal may be infused through an in-line membrane filter provided the mean pore diameter of the filter is not less than 1 µ.
Amphotericin B liposomal may be administered through an existing IV line; however, the line must be flushed with 5% dextrose injection prior to infusion of the antifungal agent. If this is not feasible, amphotericin B liposomal must be administered through a separate line. Amphotericin B liposomal should be infused over a period of approximately 2 hours using a controlled infusion device. If the infusion is well tolerated, infusion time may be reduced to approximately 1 hour; however, the duration of infusion should be increased in patients who experience discomfort during infusion. Dosage of amphotericin B varies depending on whether the drug is administered as conventional amphotericin B (formulated with sodium desoxycholate) or as amphotericin B cholesteryl sulfate complex, amphotericin B lipid complex, or amphotericin B liposomal; therefore, dosage recommendations for the specific formulation being administered should be followed. Dosage of conventional amphotericin B must be individualized and adjusted according to the patient's tolerance and clinical status (e.g., site and severity of infection, etiologic agent, cardiopulmonary and renal function status). The manufacturer cautions that under no circumstances should the total daily dose of conventional amphotericin B exceed 1.5 mg/kg. Prior to initiation of conventional IV amphotericin B therapy, a single test dose of the drug (1 mg in 20 mL of 5% dextrose injection) should be administered IV over 20-30 minutes and the patient carefully monitored (i.e., pulse and respiration rate, temperature, blood pressure) every 30 minutes for 2 hours. In patients with good cardiorenal function who tolerate the test dose, the manufacturer recommends that therapy be initiated with a daily dosage of 0.25 mg/kg (0.3 mg/kg in those with severe or rapidly progressing fungal infections) given as a single daily dose. In patients with impaired cardiorenal function and in patients who have severe reactions to the test dose, the manufacturer recommends that therapy be initiated with a smaller daily dosage (i.e., 5-10 mg). Depending on the patient's cardiorenal status, dosage may gradually be increased by 5-10 mg daily to a final daily dosage of 0.5-0. mg/kg. Some clinicians suggest that higher initial IV dosages of conventional amphotericin B can be used and generally are necessary when initiating therapy in patients with severe, life-threatening infections. The manufacturer states that dosage of amphotericin B may range up to 1 mg/kg daily or up to 1.5 mg/kg when given on alternate days. It has been suggested that after completing 1 week of therapy, adequate serum concentrations of amphotericin B usually can be maintained by administering double the daily dosage (maximum of 1.5 mg/kg) on alternate days. When converting a daily IV dosage schedule to alternate-day therapy, dosage must be increased gradually every other day until it is twice the previous daily dosage. If conventional amphotericin B therapy is discontinued for longer than 1 week, the manufacturer recommends that administration of the drug be resumed at the usual initial dosage of 0.25 mg/kg daily, and dosage should again be gradually increased. For the treatment of invasive aspergillosis, conventional IV amphotericin B has been administered in a dosage of 0.5-0. mg/kg daily; however, higher dosages (i.e., 1 mg/kg daily or, rarely, 1.5 mg/kg daily) may be necessary in neutropenic patients or for the treatment of rapidly progressing, potentially fatal infections. Some clinicians suggest that amphotericin B be administered at maximum allowable dosage (1-1.5 mg/kg daily) for the treatment of invasive aspergillosis. Optimal duration of therapy of aspergillosis is uncertain. Total doses of conventional amphotericin B of 1.5-4 g have been given over an 11-month period. For the treatment of blastomycosis, the usual dosage of conventional IV amphotericin B is 0.5-1 mg/kg daily. For the treatment of disseminated or invasive candidal infections, conventional IV amphotericin B has been administered to adults or pediatric patients in a dosage of 0.4-0.6 mg/kg daily; however, higher dosages (i.e., 1 mg/kg daily or, rarely, 1.5 mg/kg daily) have been used for the treatment of candidemia or rapidly progressing, potentially fatal infections. While 7-14 days of amphotericin B therapy may be adequate for non-life-threatening candidiasis in low-risk patients, more prolonged therapy (i.e., 6 weeks or longer) may be necessary in those at high-risk for morbidity and mortality. For the treatment of chronic disseminated candidiasis (hepatosplenic candidiasis), some clinicians recommend that conventional IV amphotericin B be administered in a dosage of 1 mg/kg daily in conjunction with oral flucytosine (100 mg/kg daily). When amphotericin B is used for the treatment of severe or refractory esophageal candidiasis in HIV-infected individuals, an IV dosage of 0.3 mg/kg daily for at least 5-7 days has been recommended. Candiduria has been treated with conventional IV amphotericin B doses of 0.3 mg/kg daily given for 3-5 days. For the treatment of coccidioidomycosis, the usual dosage of conventional IV amphotericin B is 0.5-1 mg/kg daily, although higher dosages (i.e., up to 1.5 mg/kg daily) have been used for the treatment of rapidly progressing, potentially fatal infections. The duration of treatment depends on the clinical response but usually ranges from 4-12 weeks. For the treatment of cryptococcosis, the usual dosage of conventional IV amphotericin B is 0.3-1 mg/kg daily (with or without oral flucytosine). The duration of therapy is determined by clinical response and may range from a minimum of 2-4 weeks up to several months. For the treatment of cryptococcal meningitis in HIV-infected individuals, IV amphotericin B has been given in a dosage of 0.7 mg/kg daily for 4 weeks followed by 0.7 mg/kg given on alternate days for an additional 4 weeks. Alternatively, many clinicians recommend that cryptococcal meningitis in HIV-infected individuals be treated with conventional IV amphotericin B in a dosage 0.7 mg/kg daily given in conjunction with oral flucytosine (100 mg/kg daily) for at least 2 weeks (or until the patient has stabilized) followed by 8-10 weeks of oral fluconazole (400 mg daily) or oral itraconazole (400 mg daily). For the treatment of histoplasmosis, the usual dosage of conventional IV amphotericin B is 0.5-0.6 mg/kg daily given for at least 4-8 weeks. Higher dosages (i.e., 0.7-1 mg/kg daily or, rarely, 1.5 mg/kg daily) also have been recommended and may be necessary for the treatment of rapidly progressing, potentially fatal infections. Some clinicians recommend that histoplasmosis in HIV-infected individuals be treated with conventional IV amphotericin B in a dosage of 50 mg daily (1 mg/kg in individuals weighing less than 50 kg) for 2 weeks followed by the same dosage given on alternate days until a cumulative dose of 15 mg/kg is reached. For the treatment of paracoccidioidomycosis, amphotericin B dosages of 0.4-0.5 mg/kg have been used, although higher dosages (i.e., 1 mg/kg daily or, rarely, 1.5 mg/kg daily) have been used for the treatment of rapidly progressing, potentially fatal infections. Prolonged therapy usually is required. For the treatment of disseminated sporotrichosis, the usual dosage of conventional IV amphotericin B is 0.4-0.5 mg/kg daily for 2-3 months. IV amphotericin B has been given for up to 9 months to provide a total dose of up to 2.5 g. Prolonged therapy with total IV doses of at least 2 g (alone or combined with intrathecal therapy) have been given for the treatment of meningeal sporotrichosis in a limited number of patients. For the treatment of zygomycosis, including mucormycosis, the usual dosage of conventional IV amphotericin B is 1-1. mg/kg daily for 2-3 months. A total IV dose of 3-4 g is recommended for the treatment of rhinocerebral phycomycosis; concomitant therapy has included irrigation of the sinus cavities with a suspension of 1 mg of conventional amphotericin B per mL. For the treatment of CNS fungal infections (e.g., candidal, coccidioidal, cryptococcal meningitis), intracisternal, intraventricular, or intrathecal injection of conventional amphotericin B may be used in conjunction with IV administration. For intrathecal administration, amphotericin B has been reconstituted with sterile water for injection to a concentration of 0.25 mg/mL. The usual initial dose is 0.025 mg (0. mL of the reconstituted injection diluted with 10-20 mL of CSF and administered by barbotage) 2-3 times per week. The dose is gradually increased until the maximum dose is reached that can be given without causing severe discomfort. This dose usually is 0.5-1 mg, although 0.2-0.3 mg may be effective in some infections and others (e.g., coccidioidal meningitis) may require up 1.5 mg; corticosteroids (10-15 mg of hydrocortisone in adults) usually are added to relieve headache. If conventional IV amphotericin B is used for long-term suppressive or maintenance therapy (secondary prophylaxis) to prevent recurrence or relapse of coccidioidomycosis or histoplasmosis in HIV-infected individuals whose fungal infection has been adequately treated, the Prevention of Opportunistic Infections Working Group of the US Public Health Service and the Infectious Diseases Society of America (USPHS/IDSA) recommends that adults, adolescents, infants, and children receive a dosage of 1 mg/kg once weekly. If conventional IV amphotericin B is used for long-term suppressive or maintenance therapy (secondary prophylaxis) to prevent recurrence or relapse of cryptococcosis in HIV-infected individuals whose infection has been adequately treated, the USPHS/IDSA recommends that adults and adolescents receive a dosage of 0.6-1 mg/kg 1-3 times weekly and that infants and children receive a dosage of 0.5-1 mg/kg 1-3 times weekly. Long-term suppressive or maintenance therapy for prophylaxis against recurrence or relapse of fungal infections in HIV-infected patents generally is continued for life. However, the USPHS/IDSA states that it may be reasonable to discontinue suppressive or maintenance therapy of cryptococcosis in certain adults and adolescents who have immune recovery as the result of potent combination antiretroviral therapy. For prophylaxis of fungal infections in neutropenic cancer patients or patients undergoing bone marrow transplantation (BMT), conventional IV amphotericin B has been administered in a dosage of 0.1 mg/kg daily. For the treatment of American cutaneous leishmaniasis caused by Leishmania braziliensis or L mexicana or the treatment of mucocutaneous leishmaniasis caused by L. braziliensis, the usual initial IV dosage of conventional amphotericin B for adults or pediatric patients is 0.25-0.5 mg/kg daily, with dosage gradually increased until 0.5-1 mg/kg daily is reached, at which time the drug is usually then given on alternate days. Duration of therapy depends on the severity of disease and response to the drug, but is generally 3-12 weeks and the total dose generally ranges from 1-3 g; mucocutaneous disease usually requires a higher total dose than cutaneous disease. Visceral leishmaniasis (kala-azar) in adults and children has been treated with 0.5-1 mg/kg of conventional IV amphotericin B administered on alternate days for 14-20 doses. 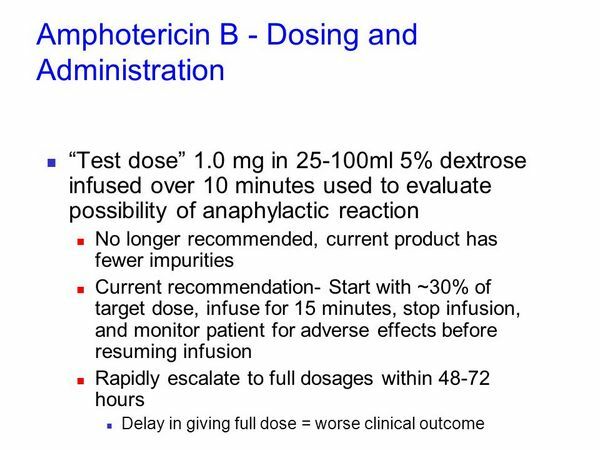 For the treatment of primary amebic meningoencephalitis caused by Naegleria, some clinicians recommend that adults and pediatric patients receive conventional IV amphotericin B in a dosage of 1 mg/kg daily; however, optimal duration of this therapy has not been determined. The usual dosage of amphotericin B cholesteryl sulfate complex for the treatment of invasive infections caused by Aspergillus in adults and children is 3-4 mg/kg once daily. Amphotericin B cholesteryl sulfate complex has been administered in dosages of 3-6 mg/kg daily for the treatment of invasive fungal infections caused by Candida or Cryptococcus in patients who failed to respond to or could not tolerate conventional IV amphotericin B; dosages up to 7. 5 mg/kg have been used to treat invasive fungal infections in BMT patients. For the treatment of visceral leishmaniasis (kala-azar), amphotericin B cholesteryl sulfate complex has been administered in a dosage of 2 mg/kg once daily for 7-10 days. The usual dosage of amphotericin B lipid complex for the treatment of invasive fungal infections in adults and children is 5 mg/kg once daily. The median duration of amphotericin B lipid complex for the treatment of aspergillosis has been 25 days. For the treatment of cryptococcal meningitis in HIV-infected adults, amphotericin B lipid complex has been given in a dosage of 5 mg/kg once daily for 6 weeks followed by 12 weeks of oral fluconazole therapy. Amphotericin B lipid complex has been given in a dosage of 1-3 mg/kg once daily for 5 days for the treatment of visceral leishmaniasis that failed to respond to or relapsed after treatment with an antimony compound. For the treatment of systemic fungal infections caused by Aspergillus, Candida, or Cryptococcus, the usual dosage of amphotericin B liposomal for adults or children 1 month of age or older is 3-5 mg/kg once daily. In published studies, the median duration of amphotericin B liposomal therapy for the effective treatment of aspergillosis or candidiasis has ranged from 15-29 days, although some candidal infections were effectively treated with a median duration of therapy of 5-7 days. For the treatment of cryptococcal meningitis in HIV-infected patients, the manufacturer recommends amphotericin B liposomal in a dosage of 6 mg/kg once daily. 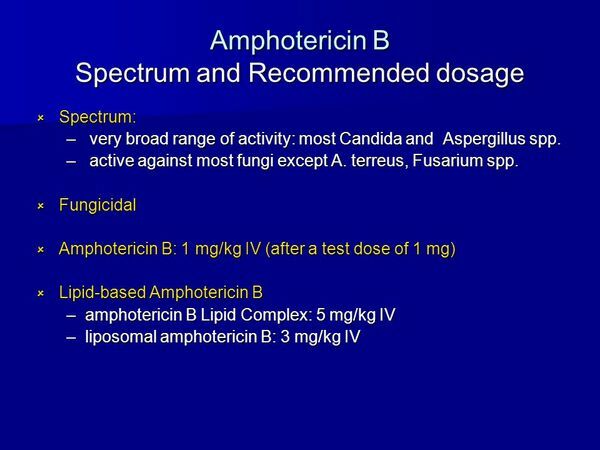 For the empiric treatment of presumed fungal infections in febrile neutropenic patients, the usual dosage of amphotericin B liposomal is 3 mg/kg once daily. In one limited study, the median duration of empiric therapy was 10. days. Some clinicians suggest that empiric amphotericin B therapy may be discontinued after 2 weeks if no discernible lesions are found by clinical evaluation, chest radiographs, or CT scans of abdominal organs. For the treatment of visceral leishmaniasis (kala-azar) in immunocompetent adults and children 1 month of age or older, 3-mg/kg doses of amphotericin B liposomal should be given once daily on days 1-5 and on days 14 and 21; a second course of the drug may be useful if the parasitic infection is not completely cleared with a single course. For the treatment of visceral leishmaniasis in immunocompromised patients, 4-mg/kg doses of amphotericin B liposomal should be given once daily on days 1-5 and on days 10, 17, 24, 31, and 38; however, if the parasitic infection is not completely cleared after the first course or if relapses occur, an expert should be consulted regarding further treatment.